Manic Street Preachers won the Inspiration award at Wednesday's Q Awards, 25 years after releasing their debut album, Generation Terrorists. Michael Sheen presented the award, paraphrasing the lyrics to Design For Life, saying: "Libraries gave us power and this band gave us power!" 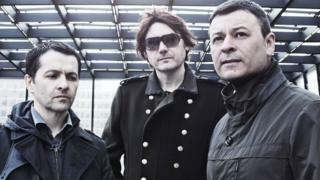 But speaking to the BBC, bassist Nicky Wire said he "didn't know" whether the band would ever release another album. "I'm in a funny place," he said. "I've kind of given up listening to music." "There's lots of good music out there - St Vincent is great, Wolf Alice I really like - but I just listen to Radio 4." Wire, who is the Manics' chief lyricist, said the band might have "overdone it" with their last two albums, Rewind The Film and Futurology. "It sapped us of our creative juices," he said, noting that it had been more than three years since Futurology - the longest gap the band ever had between releases. "It's really frightening actually because I just don't know [if we'll have another record]," he said. "It's hard to see one coming out at the moment." The Welsh band went on to play a storming, 75-minute greatest hits set at the Camden Roundhouse. Asked if the gig would provide some inspiration, Wire replied: "It might take more than that." Earlier this year, frontman James Dean Bradfield told the NME there there had been little progress on new material since the band lost their recording studio in 2016. However, he said he wanted to "kick against" the current music scene and "rock again". Other bands at the Q Awards said they doubted the Manics would call it a day. "I think he's just being modest," said Faris Badwan of The Horrors. "I think there's plenty of stuff around to inspire Nicky Wire. They're not really the kind of guys who stop making music." "That's disappointing to me," added Biffy Clyro's Simon Neil, "but I can understand it". "You feel there's a real drought at certain points. You think maybe you've written your best song. "[But] I don't see Nicky actually being able to give up. He might not have written a song for a while, but now that he's said that, he's probably going to write a hundred." Ellie Rowsell, lead singer of Wolf Alice, said that Wire's decision to stop listening to music could be a sensible one. "Some of my biggest inspirations don't come from music so that doesn't strike me as too much of a problem," she said. "Radio 4 is banging." Wire himself offered some hope, saying he often swore off music before beginning a new album. "Is it something I do to clear the palate? It is, sometimes. Otherwise I end up nicking too much," he said. "So we might have a surge over the next few weeks and chuck something out. You never know." Simon Neil added that the end of the Manic Street Preachers would be "a huge loss, unless Nicky becomes the head of Plaid Cymru, which I can see happening. "He's incredibly eloquent when he speaks about politics."